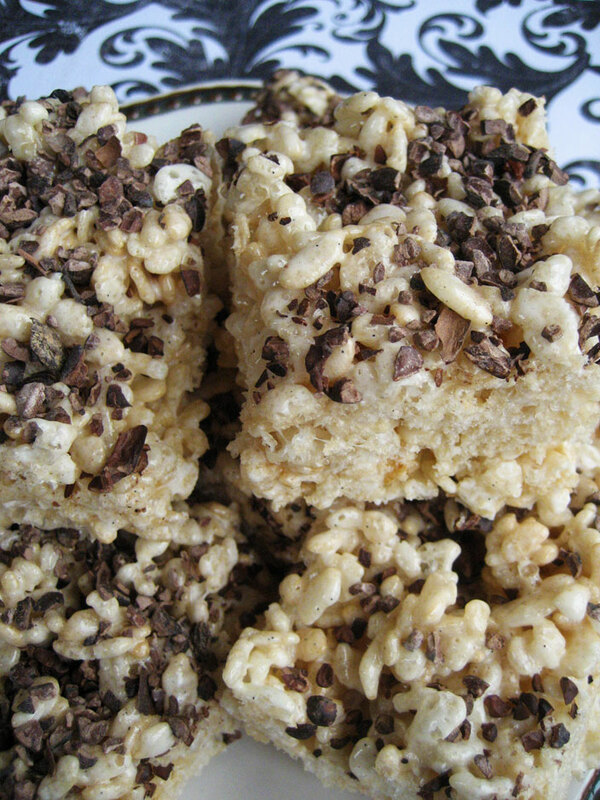 Z had been asking me to make Rice Krispies Treats for the past couple months and I finally gave in – on one condition. That I make them with homemade marshmallows. It’s not hard to get anyone to agree to pillowy homemade marshmallows, though I couldn’t convince him that the Treats would be better if I flavored the marshmallows with rose water or almond extract. So we went with vanilla bean. There's bean specks in there! I also had a little stroke of genius and offered to sprinkle the Treats with cacao nibs. My offer was gladly accepted. 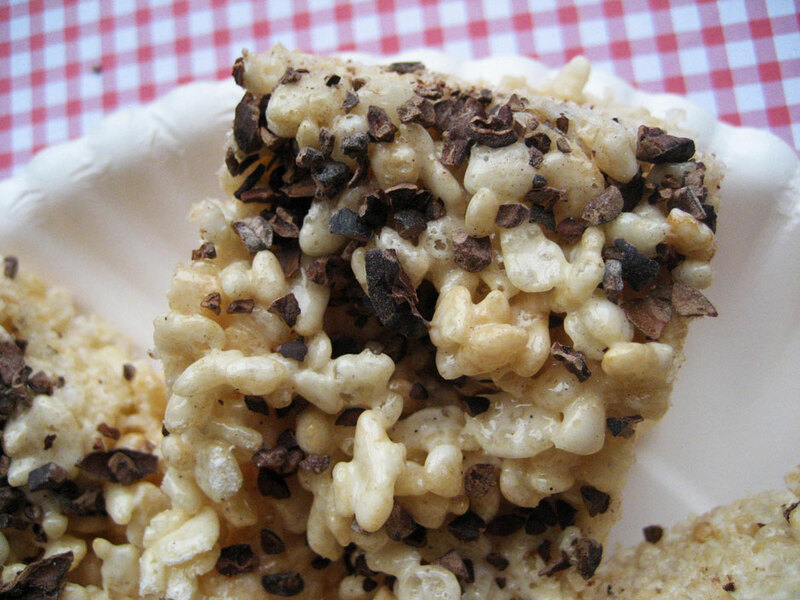 I love the way the side of a cut rice krispies treat looks. I love using cacao nibs instead of chocolate chips for things like this. As long as you have sugar in whatever you’re adding the nibs to, it’s like adding a little extra-dark chocolate, without overloading on sweetness. You probably already know all about that, though. But if you didn’t…now you do. Just because I was vetoed out of making a more creative flavor of marshmallows shouldn’t discourage you from trying, if you’d like. Matcha marshmallows would be very nice with the puffed rice. Saffron (which I’ve never tried, believe it or not) goes quite well with rice, according to The Flavor Bible, and there are recipes out there for saffron marshmallows, so that’s a really neat idea to consider. Coconut, ginger, lemon, strawberry or chocolate marshmallows would all work great, too. Originally I toyed with the idea of trying to puff my own rice, but that’s very hard to do at home without a crazy steam injection system, apparently. You can fry the rice to puff it, but that’s for more of a garnish, and it would be a pain to get the required amount of rice using that method. There’s only so far I’ll go to make things as homemade as possible. Oil a silicone spatula and prepare a 9×13″ baking dish with parchment. Place the marshmallows and the butter in a large saucepan over medium heat and melt completely, stirring gently the entire time. Remove from heat and stir in the cereal with the oiled spatula, using a folding motion. Once it is fully incorporated scrape it into the prepared dish and pat down and level the top as much as possible. Sprinkle with cacao nibs and allow to set for a few hours or overnight. Once set, cut into squares. We return to your regularly scheduled ice creamy decadence tomorrow. Love, love, love, love LOVE this! Oh wow, I just got so excited about this! Cacao nibs! Brilliant! 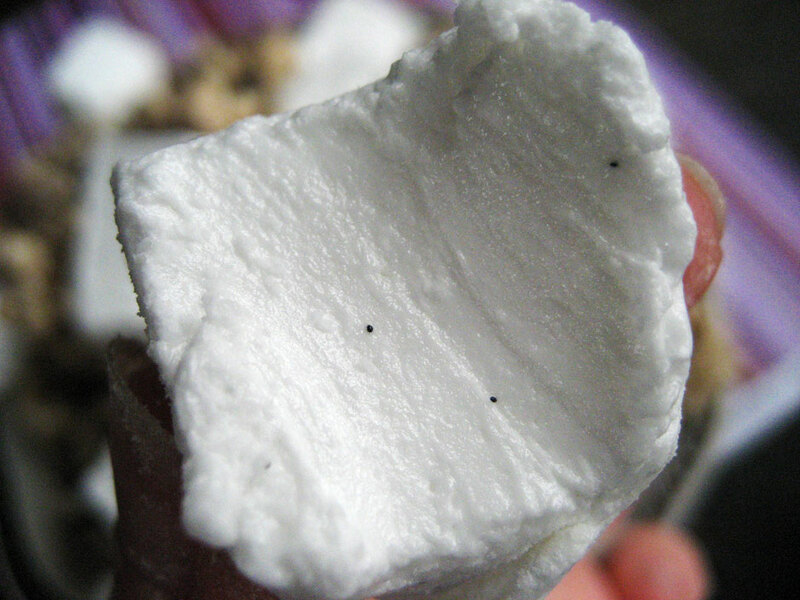 Oh I always wondered if you could make thing with homemade marshmallows! These look really yummy! 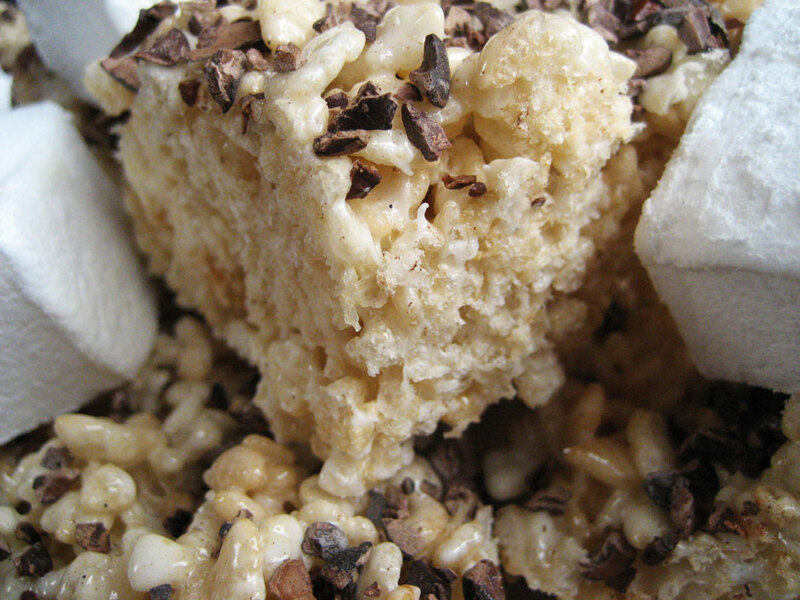 The rice crispy treats were wonderful but the marshmallows on their own were absolutely addictive. I ate about 12 of them before I decided that was enough sugar calories for one day! 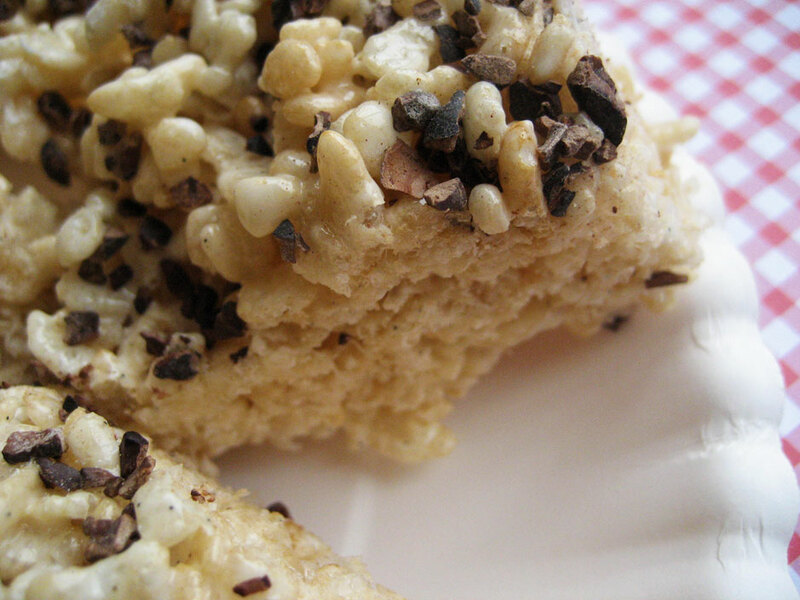 Rice Krispies have never such such great company! 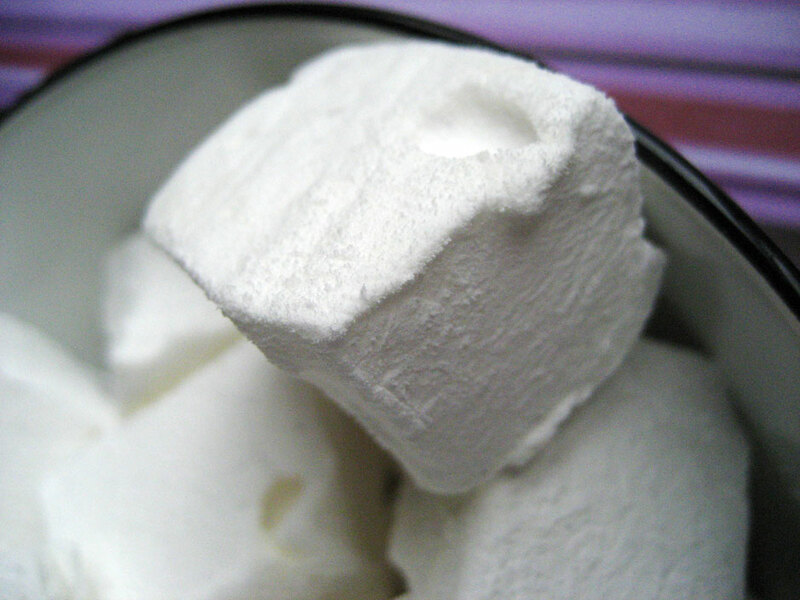 Kudos to you for using home made marshmallows (such a treat!). I need to try those cacao nibs, I keep seeing them everywhere and they sound so good. 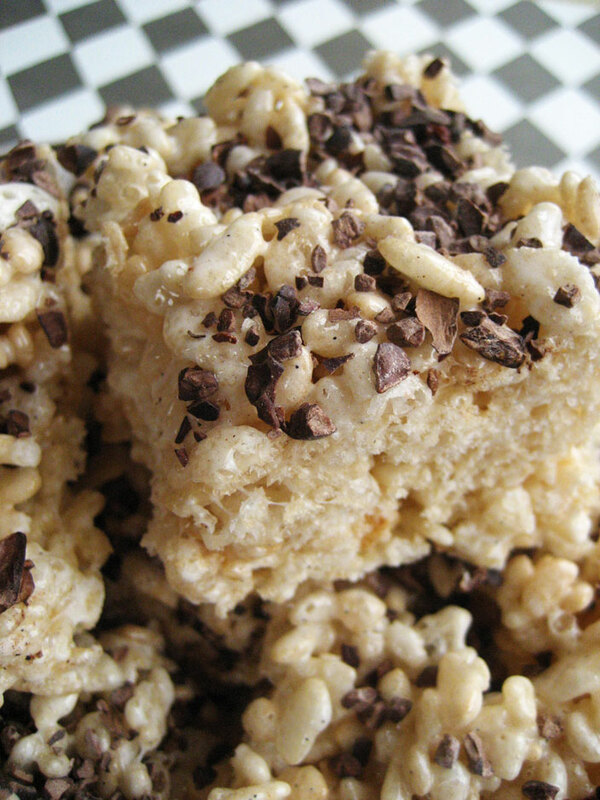 They look great on your rice crispy treats! 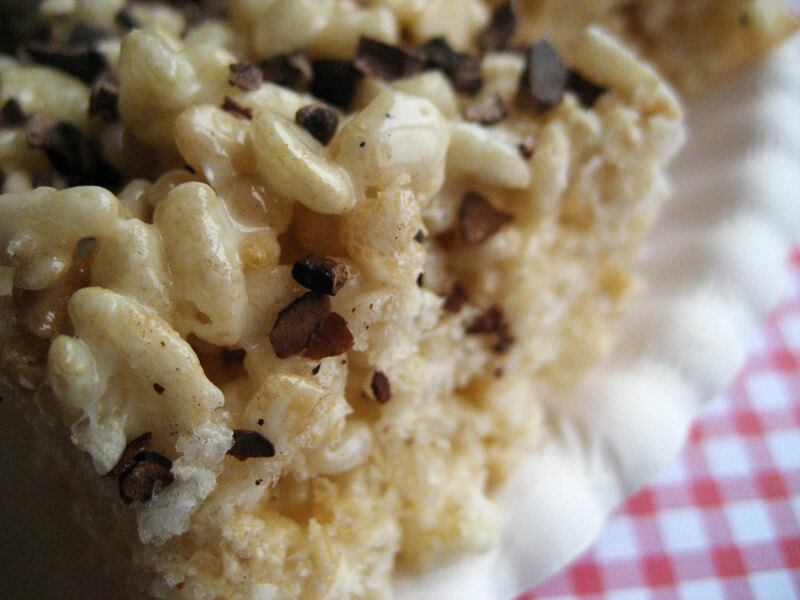 Awesome that you did your own marshmallows too, and I love that you considered puffing your own rice, how cool is that? Haha…a combination of regular exercise, eating mostly fruits & veggies, and sharing. I’m good at sharing. I have a bag of cocoa nibs in my pantry. Thanks for giving me an idea for something sweet and new to do with them. OH MY…. these look just delicious. I will try and let you know how they come out!!!! !